While the weather here in New England has been surprisingly mild of late, business has been anything but. In fact, this has been, so far, our busiest November and December ever in both units and $’s. And we still have a few weeks and one show to go. Not to mention one more Early Bird, which will go out on December 13th just before 50% of Team CRO (i.e. your author) jets off to Las Vegas for the PCGS Member’s Only Show where we hope to finalize a pretty big deal that has been in the works for, oh, 3 months or so. We also hope to find a few other coins to buy while we’re there and grade a coin or two (dozen). I was just leafing through the latest catalog from one of the numismatic literature dealers and noticed, in their photo of some obscure item they are selling, a fuzzy picture of a coin that I believe we own but could never trace before. You have no idea how exciting this can be (unless you have ever tried to plate match coins to old catalogs and references like we do and understand the needle-in-a-haystack nature of it). In the process of organizing the year-end data, we've confirmed a trend that seemed evident during the year, namely a significant uptick in new, first-time customers in 2011 vs prior years. And obviously we like when this happens, especially when it is a customer who has never been to our website and found us via one of our ads in CoinWorld or Numismatic News. Such as our 2011 Xmas ad (always my favorite one of the year) which has just been posted to the Ad Archive section of the site. One federal coin, two colonials and one pillar coin toward a high-end colonial on our list. And (though it has not been consummated yet) the latest trade deal we are working on involves receiving a significant collection of high-end modern error coins and error currency in exchange for three of our expensive colonials, which demonstrates without any doubt whatsoever that we are open to pretty much any kind of trade as long as it works for both parties. So if you ever see anything of interest on the site that is just a bit out of reach, keep in mind the trade option. 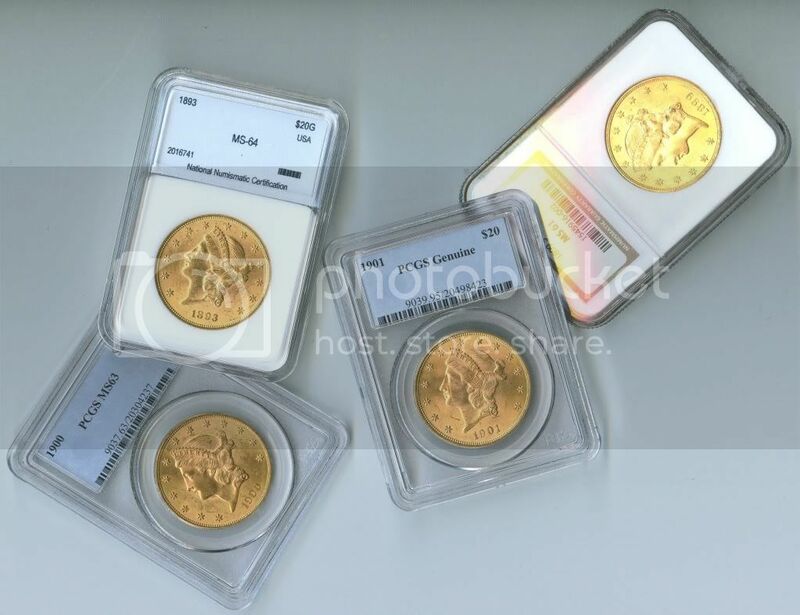 We are still waiting for our winning lots to arrive from auctions weeks ago in Baltimore and Europe, which can frankly be maddening at times, especially when you have paid already, and have customers waiting for the coins. Not to mention the slew of grading submissions due back from PCGS which we are patiently waiting for by going to the submission status section of their website and hitting the refresh button on our browser dozens of times in a row. Newsflash: This does not make the grades come back any faster. We were quite pleased to sell a couple of coins off the last EB to a dealer who reported to us days later that he had sold them already, which is exactly the outcome we like to hear. We are down to just a couple of the hats shown on the site and will be changing to the new hues shortly. So if you are interested in the ones currently shown, you are flat running out of time. Just read this AM about the sale of a Brasher Doubloon for a cool $7.4 Million, a record for any colonial era issue by a factor of 2x+, which seems like a better deal to me (relatively speaking) than some of the other recent mega-priced coins we've read about. Our own Dave Wnuck recently participated (along with a bunch of industry heavyweights) in the Rosen Numismatic Advisory’s Crystal Ball Survey 2011 where he answered questions such as “What is your favorite undervalued series?”. If you want to see the answers, contact publisher Maurice Rosen at mauricerosen@aol.com and subscribe to the newsletter, or check back here early next year when we reprint the questions and DW’s responses (sorry, we cannot post the others) in our Coin Commentary section. Prior to that, however, will be our annual “The Year in Review” column which will be posted here right at the end of December (and not sooner, since the year ain’t over yet and we are hopeful some other good stuff will still happen).